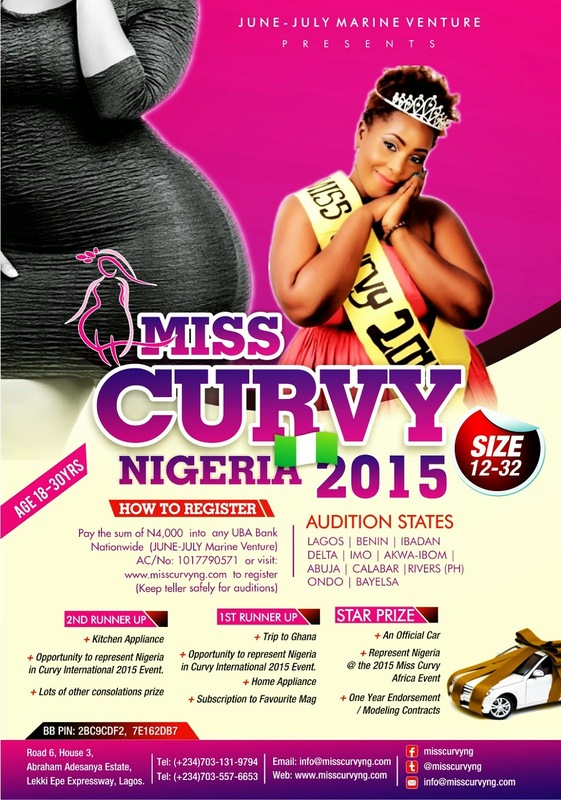 2015 MISS CURVY NIGERIA BEAUTY PAGEANT. The Competition is open to Nigerian females between the ages of 18-30 ‎with Size 12-32. Pay the sum of N4000 into any of the following accounts. FCMB BANK. Account Name: June- July Marine Ventures . Account Number: 3023368015. This ‎is one great opportunity you have been longing for to become a star, be proud of yourself, you are not FAT but FABULOUS. Corporate companies, fashion designers, stylists, make-up artistes and media platforms, this is Nigeria & Africa's biggest pageant to be part of. For sponsorship and partnership details, contact 07035576653, 08124388793.